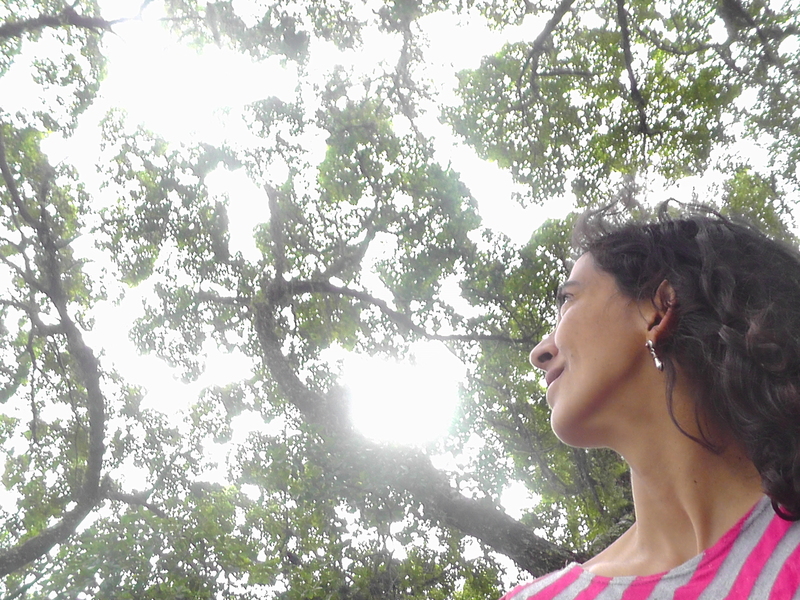 Adventures on Land, part 1 – Urban Tree | Surfer Grrrls Brazil! The other afternoon during a brief visit to the town center, I was walking back from the supermarket with my pandeiro slung across my shoulder and an overwhelming amount of groceries dangling from my person – bulging from my backpack, swinging from my wrists in shopping bags. As I was heading to a friends house to drop off the groceries, and then to the gym for a class, I passed a little park in the middle of a busy street intersection. 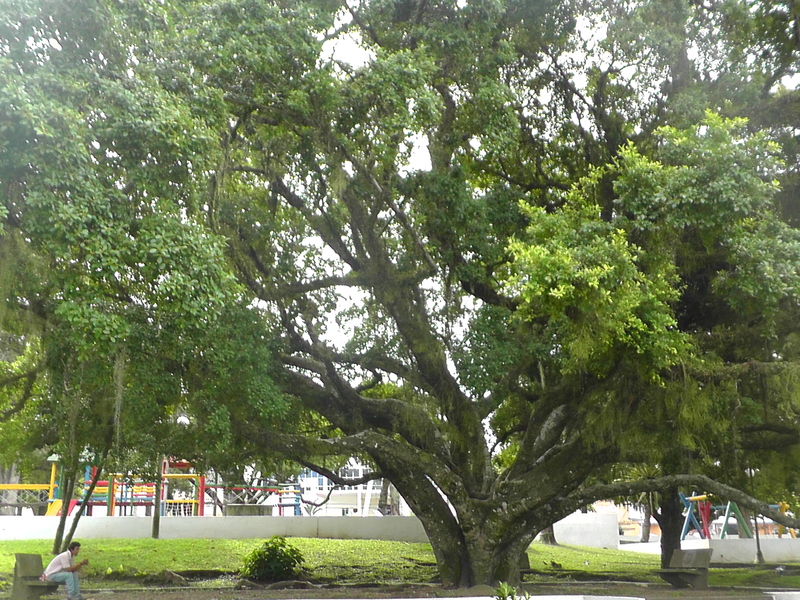 The centerpiece of this park was a beautiful old broad meandering tree – a perfect beauty for climbing. I imagined that at different times of day, the tree swarmed with frolicking little kids or served as a partially obscured hangout for transgressive teens. But at this moment, its branches were bare. Naked. Inviting. A monument of exploratory arboreal possibility. To leave a tree like this unclimbed constituted a form of neglect. But I was hurrying to get to a class at the gym. It didn’t seem like the time to be dawdling. The park was also public enough, and I am also grown enough, that a solo ascent of the tree with my bags of groceries and my pandeiro in tow, would designate me immediately as a public wierdo. “You can come back and climb that tree later,” I told myself, one evening when there is no one watching. But as I walked by, I kept looking at that tree. Not wanting to look like a weirdo seemed like a really bad reason not to climb such a beautiful tree. Making it to my class at the gym was a noble goal, but did I really want to live in a universe where I couldn’t make time to stop and climb a tree, especially one as perfect as this? I suddenly felt like if I walked by this tree, I would be killing a little part of my soul, and it seemed too early to start doing that. “Screw it,” I thought – I am gonna be a weirdo and I am gonna be late. And so I went back, put my groceries at the foot of the tree, lodged my backpack and pandeiro in the first big crook, and headed up this sweeping grand dame of a tree. This tree had sturdy thick branches, fat as telephone poles which extended almost horizontally out from her main trunk. There were about 7 different routes you could take outwards from the central hub, walking on wide gray smooth branches, speckled with lichens and epiphytes. For me climbing a tree is liking pushing a little reset button for my soul. When I leave the ground, I leave my human self behind, and I can live for a moment as the spritely elfin monkey self of all my childhood dreams. In the tree, there is only the feeling of branches under my hands and feet and the gauging of my movements to move through them. The light is different, filtered through the crown of leaves that makes the tree a universe apart from the outside world. When I am in the arms of a tree, it feels like the only worthwhile place to be. I dawdled in the tree for a while, taking a couple snap shots to commemorate the experience, and no doubt providing some lively midday entertainment to the good people enjoying their lunches on the park benches surrounding me. I landed back on the ground feeling lighter, with an extra kick in my step, relieved to know that I still had what it takes to be a wierdo, climb a tree in the middle of an intersection at midday, and keep my soul intact.